The mysterious sapphire, like the ruby, is a variety of corundum. Its name comes from the Greek sappheiros, derived from the Hebrew sappire, which means “blue.” It was famous in ancient times, and it adorns a lot of jewelry from ancient empires. It is also mentioned in legends of various nations. Traditionally, the 45th wedding anniversary is called a sapphire wedding. A sapphire ring and matching earrings or a pendant is a sure-fire idea for a present not only on this occasion but on all the days you want to show your partner a little love. Persians used to believe that the Earth was supported by a large sapphire and the sky blue color of the atmosphere is its reflection. One legend from Sri Lanka tells the story of a man who was an excellent hunter. He hunted with a boomerang, and he fell in love with a star that he admired in the sky every evening. When an animal attacked the hunter one evening, he used his boomerang and hit the star, and a chip of it fell at his feet. It had a shiny blue color with the celestial reflection of the star. And that’s how the so-called star sapphire came into existence. Each color variant has its own unique name which is used in Asia to this day. For example, nilamani is a name used for a blue gemstone, Jalneelam are stones with the color of light blue water, and indranila are dark blue Kashmir sapphires. Hinduists associated the padparadscha sapphire (the name means “a lotus flower”) with the highest caste, Brahmans, which it is supposed to protect. 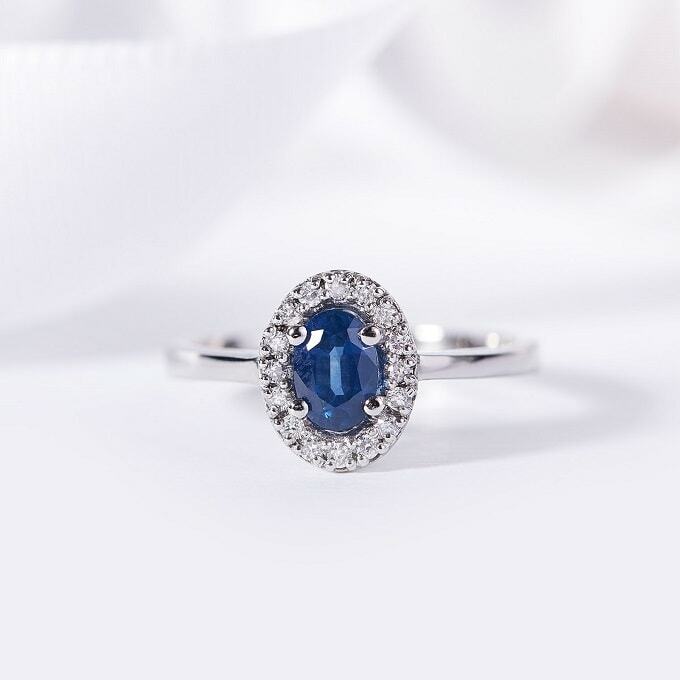 In modern studies of the zodiac, the sapphire is found to be beneficial for Tauruses, as it is as simultaneously persistent and fragile as they are. However, it is also compatible with Scorpios, Aries, Leos, and Sagittarians. It’s also said that sapphires watch over the people born in September. They are symbols of fidelity, honesty, and truth. For centuries, people believed they bring calmness and wisdom to one’s mind. They protect their wearer, and their protection is thought to be so strong that the protection remains even when you take the stone off. Corundum covers the whole range of colors with its variants. Sapphires are usually blue; all of the non-blue stones are the so-called fancy sapphires, with one exception. The hotly debated exception is the red ruby. Even expertly trained gemologists can’t agree on whether a pink corundum should be called a pink sapphire or a light red ruby. With KLENOTA jewels, however, you’re sure to find the name pink sapphire in our collections. People appreciate blue sapphires the most. Sapphires stand out among other minerals thanks to their color and hardness. 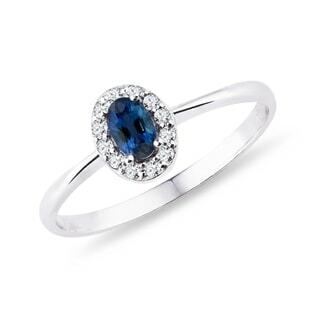 If you love blue stones, a sapphire is a perfect choice. However, this gem’s range of beauty calls to more people than just azure lovers, as it comes in many color variants (and even multicolored). The gemstones of the non-blue variety are called fancy. Some of the most expensive variants are salmon, pink-orange, and orange-pink gemstones called padparadscha. These sapphires are unique with their ratio of pink and orange, and no two are the same. There is a rule that the more intense and vivid the hue of the stone is, the higher the price. But also the purer the stone, the more expensive. As the gemstones are light, any imperfection in them is visible. Therefore, a buyer often faces a dilemma whether to go for greater purity or a more vivid color. And unique colors often win. The cut also deserves attention, it is asymmetrical in many cases due to the lack of raw material suitable for cutting. Therefore, it’s more common to cut into shapes by which the least waste is produced. According to information from Gemval, the price of sapphires has increased by 38% in last 10 years. Large sapphires are treated as investments and the price of a carat (0.2 g) can be around one million CZK (44,000 USD). Taking care of sapphires is quite easy, thanks to their hardness. It’s difficult to scratch a sapphire, but it definitely doesn’t like temperature shocks. 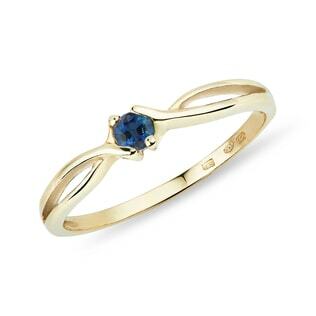 Blue sapphires look great in combination with both white and yellow gold. Recently, rose gold jewels with sapphires have risen in popularity. 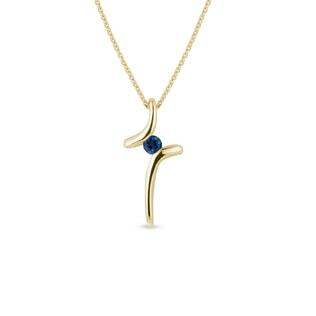 Colorful gold in combination with a blue sparkle of a sapphire creates warm, elegant jewelry. Sapphires can be easily replaced with glass, cubic zirconia, or synthetic spinel. Also, the labels of colorful variants of synthetic sapphires and other stones may be confusing and misleading. These commercial names should only be used to get a better idea of the color shade. The names of natural stones are often used for this purpose (e.g. ruby – red, grenade – vivid red, topaz – yellow, palmeira topaz – brown, madeira topaz – yellow-brown, etc.). However, the stones have nothing in common with sapphires except for the hue. The color of a sapphire and its structure can be modified in a lab. Most often, it is done by annealing (yellow and orange sapphires), chemical oxidation/reduction (blue sapphires) or radiation. These methods are accepted in jewelry-making, but they decrease the price of the stone. Most of the sapphires on the market today are modified in this way. Natural gemstones with that beautiful blue hue are extremely rare, and their price is very high. Besides modified stones, there are also synthetic sapphires produced in a lab on the market. The first synthetic sapphire was made in 1907 by the so-called Verneuil process (it is also used for the manufacturing of beautiful corundum cones). Such sapphires are quite durable and cheap, and you can distinguish them from natural gemstones by the curved lines of color unevenness, visible under the microscope. Also, synthetic sapphires in antique jewels are worth noting; their beauty, and their price, are often unbelievable. We only buy gemstones for our KLENOTA sapphire jewels from verified and, if possible, local sources. We guarantee the authenticity of sapphires by the authenticity certificate that you will get for free with every jewelry purchase. From the chemical point of view, sapphire is aluminum oxide. The sapphire is a stone of many color shades, which are caused by smaller amounts of various elements. Blue sapphires get their shade because of titanium and iron, which are freely dispersed in the stone. If there are inclusions, the stone is pink. Padparadscha stones include iron, titanium, and, mainly, chromium. The colors of the so-called fancy variants are influenced by the presence of copper, chromium, vanadium, and magnesium. With regard to hardness, only the diamond is harder than the sapphire. The sapphire is characterized by its glassy luster and white streak. It creates tabular, columnar, bipyramidal, and other structures of crystals. It can be clear or even transparent. It often forms in twin structures. It is created in transformed rocks rich in aluminum and poor in silicon. It can be damaged by hydrochloric acid and hot concentrated sulphuric acid or phosphoric acid. We can see an interesting effect in sapphires and rubies which is called asterism (a star effect). It is mainly visible in cabachon cuts (a rounded cut with a flat bottom surface). It is caused by inclusions of the rutile mineral, oriented in three directions. Light is reflected outward from these, showing a six-pointed star formation on the surface of the stone. If there are more rutile lines in the stone, stars with more points emerge. The best sapphires are formed in Sri Lanka and Myanmar or crystallized in Kashmir. Those with lower quality may come from Thailand or Cambodia. Australian and East-Asian sapphires come with a lower price tag, as they have undesirable greenish tones. African stones can be distinguished because of their brownish tones. Padparadscha sapphires of the finest quality are mined in Sri Lanka. In the Czech Republic, sapphires, in the past, were found on the renowned and currently protected Jizera Meadow. The Czech Republic also boasts some of the most famous sapphires in the world, as they are fitted into the Crown of Saint Wenceslas. Some of them weigh over 200 ct (40 grams); one of them even weighs over 300 ct (60 grams). Other famous sapphires can be found in the English royal crown. One of them is the St. Edward’s Sapphire, and the other is the Stuart Sapphire. Sapphires are also greatly popular with celebrities. For example, Princess Diana used to wear an engagement ring with a 12ct sapphire. Now, it belongs to Duchess Kate, the wife of Prince William. The most famous blue sapphire in the world is called the Star of India, and it was discovered in Sri Lanka 300 years ago. It is a 536ct (over 100g) star sapphire, which was gifted to an American science museum. It was stolen from there by the thief Jack Murphy, but eventually found two months later. In ancient times, sapphires were also frequently used for miniature manufacturing. A light blue sapphire miniature of Buddha is well-known. The largest padparadscha sapphire comes from Sri Lanka. You can see it in a science museum in New York, and it is a record-breaking sapphire indeed: it weighs 100.18 ct (about 20 grams).